In his great work, The Twenty Years’ Crisis, originally published in 1939 on the eve of the Second World War, E.H. Carr discussed at length the relationship between law and politics. His purpose was to explain why conflicts in international relations were less prone to being dealt with through legal channels than conflicts at the national level. Carr argued that political disputes could only be judicialised if there was a strong ‘common feeling’ binding the two parties, allowing them to accept the decision of a third party even if the decision was against their interests. In this discussion of the limits of international law, Carr provides us with a very useful insight into the nature of domestic legal disputes. In his account, law inevitably depoliticises: it takes an issue out of the political realm and locates it within the judicial realm, where both parties accept that a third party can decide on the dispute on their behalf. The conflict is taken out of society proper and put before the judge, on the presumption that everyone will be given a fair hearing. This can only occur if both sides trust the legal system and believe that a felicitous combination of common sense and impartiality can lead to a resolution of the conflict. Carr was very clear that for some issues — such as disputes around the need for conscription, abolishing means testing, the legal status of trade unions, and the nationalisation of strategic industries — impartiality was impossible. Such disagreements were inherently political, and could only be decided by electoral victories or through the use of extra-parliamentary force. In other words, for Carr, law and politics were functional equivalents, both fields dealing with the resolution of conflicts, but their manner of dealing with them quite different. This is still the case today. Law treats a dispute as a technical matter to be resolved by the legal reasoning of the judge after hearing the point of view of both litigants. Political disputes instead reflect fundamentally different worldviews; any attempt to judicialise them must involve some convergence in order to remove the critical points of disagreement. To return to Carr once more, “judicial procedure cannot operate without accepted political postulates”. The foundation of all law is political consensus. What marks the growing interest in and acceptance of judicial power on the left is thus an erosion of the ideological conflicts that historically have pitted the political left against both the law and the capitalist state. For these reasons given by Carr, it is unsurprising that there is a long tradition on the left of scepticism towards the law, courts, and to judicial power in general. Embedded within a national state apparatus, the legal system represents the state and state power, making it difficult to reconcile with ideas of impartiality and neutrality. A critique of legal forms, as well as an interest in the contradictions present within different regimes of legal rights, was central to many of Marx’s early writings (see Coletti, for a collection of these writings on law; see also Ewing and Gearty). The legacy of this has lived on in a libertarian tradition on the whose hostility to the law reflects a deeper scepticism about state power in general (see Thompson, and Griffith); it also persisted in some of the work on law done by Frankfurt school theorists, especially Franz Neuman. Other strands of thought on the left have tried more explicitly to derive law and the legal system from commodity exchange and capitalist social relations. This critical attitude towards the law on the left has deep theoretical and empirical roots. The left’s conversion to judicial power thus has complex origins, and the account given below is merely illustrative of some of these origins. Two turning points in particular are discussed. The first involves a reconciliation with the national state after a long period of commitment to internationalism. The second is more directly about law itself, and the emergence on the left of the view that the law can operate as a substitute for politics and as an instrument of social reform in its own right. This later development remains a point of contention, as much evidence suggests that, in practice, law is a poor substitute for politics in this regard (see the chapter by Harlow in this volume). However, a positive attitude towards judicial power remains the rule today on the left, and a critique of it the exception. A key transition for the left was its abandonment of the internationalist characteristic of the late nineteenth and early twentieth century and its retreat behind national barriers. Decisive in this regard was the national form taken by the Russian Revolution after the emergence of Stalinism. In the rest of Europe, the contrast between the political consequences of the First and the Second World Wars is instructive. The 1914-1918 conflict left the labour movement radicalised and class conflict reached an apogee immediately after the war. The British left is a case in point, where such politicisation severely tested the unity of the workers’ movement. 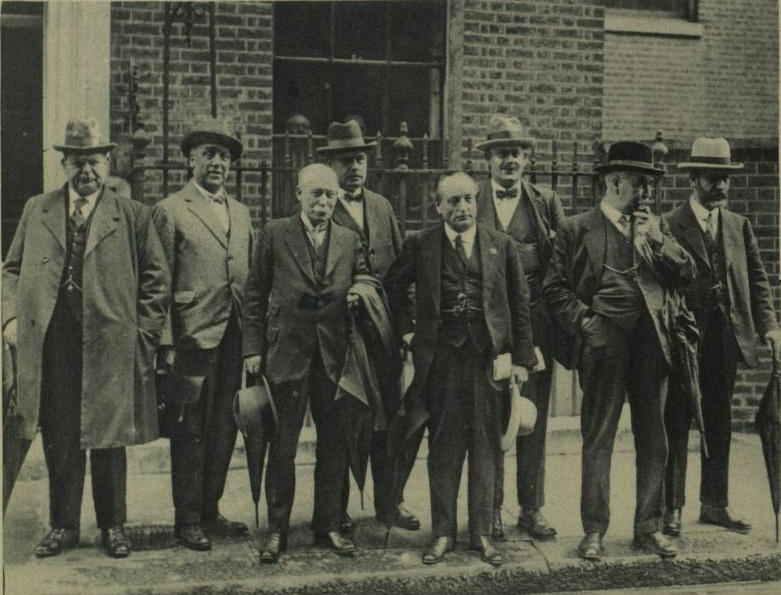 Some of the leaders of the Labour Party were hostile to the 1926 general strike out of fear that it would empower the more radical elements of the labour movement and push the country towards social revolution. The Trade Union Congress called for the strike but limited it to specific sectors, also fearing the consequences of an all-out strike. Whilst a test for the left in many ways, the general strike was a highpoint in labour mobilisation and led to the longest period during which emergency powers were in force, a sign of the fear it elicited amongst the ruling classes. In time, the radicalism of the post-1918 moment failed to carry itself through and in some places — such as Germany — the whiff of socialist revolution did not hang for very long in the air, giving way to the heady but short-lived prosperity of the ‘Roaring Twenties’. The Second World War was different: the labour movement committed itself to the national war goals in a way that laid the basis for the post-war class compromise that was so important for the economic boom of the 1950s and 1960s. Political moderation, not radicalism, was the consequence of the 1939-45 war and the left’s relationship with the national state was cemented and the basis for the expansion of civil, political, and social rights after the war. Reconciliation with the national framework of politics did not mean the end of transformative social programmes for the left; just that the scale of the change was national rather than international. The distant and often hostile relationship to judicial power continued, as the law often functioned as an obstacle to radical change, giving life to E.H. Carr’s distinction between political and legal disagreements. The left may have abandoned some of its internationalist aspirations, but its commitment to popular sovereignty — and to using the state power to build a more equal society — remained strong. What was more decisive in finally pushing the left towards a reconciliation with judicial power was the crisis in the belief in the state as an agent for social transformation. This was a crisis in the very ideas of socialism and — more moderately — of social democracy, and a sign that the left’s close relationship with the principles of popular sovereignty was beginning to unravel. This crisis came in the 1970s, when the post-war era of growth ended. Tellingly, during this decade, serious efforts were made to resolve the problems of price and wage inflation through constructing supranational monetary frameworks, where inflation-prone economies such as France would ‘import’ German monetary discipline by tying its currency to the German Deutschmark. A reliance on rules external to national politics — that is the sharing or the pooling of sovereignty — became a hallmark of European political economy, and this became a way in which labour unrest was contained and managed. This was only a shallow form of judicialisation, given the limited legal stature of European monetary cooperation at the time, but it was a step towards it. A third party able to arbitrate in disputes had been identified and its name was ‘Europe’; not everyone accepted its legitimacy to do so at the start but over time they did — the left and the labour movement in particular. The French case here is particularly illustrative. When France elected its first ever Fifth Republic socialist president in 1981, François Mitterrand quickly set about to realise his promise of ‘Keynesianism in one country’. This programme ran aground in 1983, when pressure mounted on the French franc, forcing Mitterrand to decide whether or not he should take France out of the European monetary system. Mitterrand hesitated for some time, aware that the issue here was both the autonomy of national macro-economic policy and a shift in the balance of political priorities, where the burden of adaptation was to be placed on wages and prices rather than managed through currency depreciation. The decision to keep the franc in, which Mitterrand made in 1984, was crucial as it created the political consensus across Europe needed for the relaunching of European integration. The Single European Act of 1986 was a body of law introduced to facilitate economic exchange across the European economic space. The political consensus for this legal framework was the scaling back of transformative projects on the part of national left parties, with France taking the lead. This consensus also made it possible for hitherto fundamentally political disputes to be sent up to the European Court of Justice and resolved as technical matters of compliance with European treaty law. This growing alignment of the European left with judicial power was driven partly by external pressures: the internationalisation of economic life, and the ability of capital to move making Keynesian economic programmes more difficult to implement, especially within a European single market. But there was also an ideological change taking place. Richard Tuck has identified the roots of this: a left seeking the “shelter of continental-style structures”. This is most striking in the British case, where the tradition of parliamentary sovereignty has meant that constitutional impediments to radical social change were relatively weak. What mattered instead was building political majorities able to direct such change through parliament. Elsewhere in Europe, such impediments were readily available at the national level, but this did not stop the search for a pan-European model, eventually found with the European Court of Justice and the European Charter of Fundamental Rights, and, much more broadly, with an embrace by the left of human rights and international human rights law. A recent example serves to bring out this change. The response to the British government’s White Paper on the rights of EU nationals in the UK post-Brexit has been largely negative as many have felt that the rights outlined in the paper fall short of what the EU currently offers via its own legal framework. In some specific instances, this is true. However, the thrust of the criticism has been that the UK government provides no guarantees of the rights that will be held. Moreover, the only guarantor of whatever rights are given to EU nationals living in the UK post-Brexit will be British courts, as the ECJ will no longer have jurisdiction. This last point is crucial and opposition to it is telling. In short, the message of the critics is that they do not trust the British courts to uphold their rights; they would prefer the security they associate with the European Court of Justice. The reason for this is the ‘politicised’ nature of the British legal system, originating in the doctrine of parliamentary sovereignty. It is thought that this doctrine opens up the possibility of rights being taken away or whittled away in the future, this in spite of the fact that the doctrine has co-existed for centuries with a “remarkably tolerant and liberal social order”, and that many countries with more EU-style constitutional arrangements have experienced prolonged periods of democratic collapse. What lies behind the left’s growing acceptance of judicial power is a broadening pessimism about using the instruments of politics for significant and lasting social change. This is odd not least because historically speaking, and most strikingly in the British case, progressive social change has come principally through parliament and through political struggles, and only occasionally through the courts. An acceptance of constitutional rules was more readily found in the continental European left owing to different legal traditions, but we see here a similar flight from the national to the supranational in search of legal frameworks that can ‘lock-in’ progressive legislation and insulate it from the dangers of political reaction at home. This tells us that the left has given democracy up to its opponents, preferring to strike a bargain with judicial powers. However, as Carr argued, the legal framework always rests upon a political foundation. This foundation is today defined by a commitment to individual rights and to markets. It is far removed from the commitment to social transformation and a transcendence of market society that was once was a hallmark of the political left. Chris Bickerton is a Reader in Modern European Politics at the University of Cambridge, and a Fellow of Queens’ College, Cambridge.